Head back to a time when synthesisers dominated music, big hair was cool, and neon was the norm. 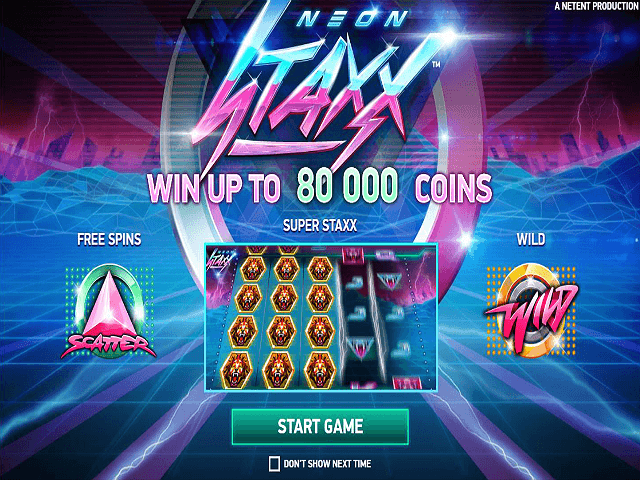 That's right, the Neon Staxx online slot catapults you into the retro future landscape of the 80s. Grab your hairspray, and read on. 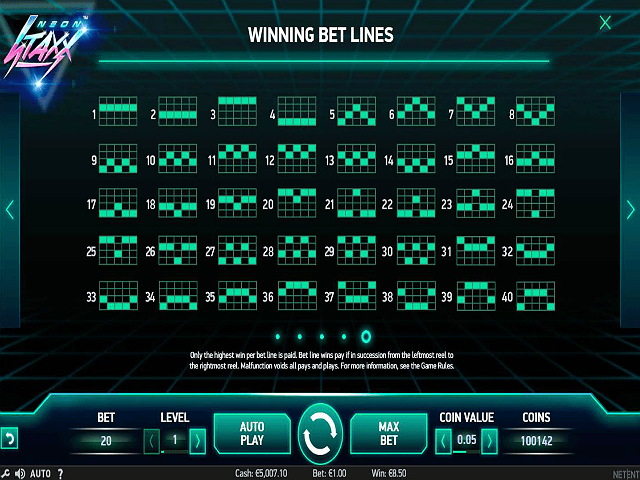 This online slot from NetEnt features five reels and 40 paylines spread over four rows. 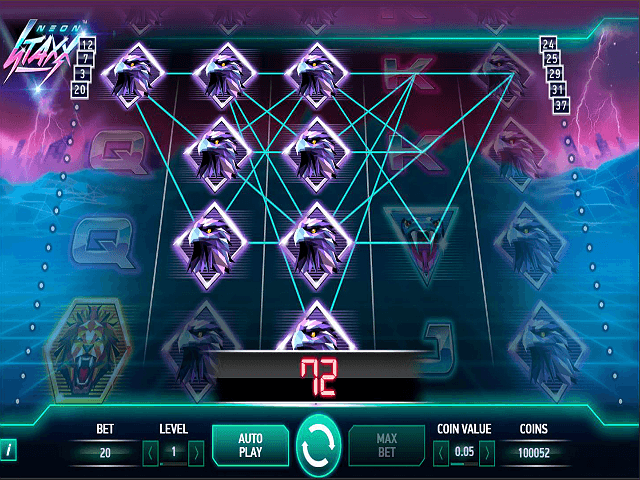 There's a free spin feature as you might expect, but the real draw of the Neon Staxx slot is the SuperStaxx feature, which we'll look at later in this guide. Play Neon Staxx for Real Money! The bright retro theme grabs you right away, but thankfully it's not overwhelming. The pink and blue backdrop with a city skyline is very reminiscent of 80s classic Tron, and really fits with the space-age synth soundtrack. The information display at the bottom is an easy-to-see neon green, and the symbols themselves are bright and simple to identify. There's one bonus round you can access, as well as the free spins. While this is a pretty standard online slot in most ways, it's also a little more fast-paced than some. You can also play on any device, so a slice of classic high-octane 80s gaming is always on hand if you need it. While it doesn't have the huge jackpots of other video slots, the 200x jackpot and bonus modes are more than enough to keep you smiling if you land a win. It also has a pretty good return to player, at around 96%. There are five reels and 40 paylines in total in Neon Staxx, so there are plenty of opportunities to land a win or get into the bonus round. As well as the decent player return mentioned above, you can choose to go in as low as 0.20, or as high as 100 coins. The symbols are fairly standard – but it's the eagles, lions, snakes, and panthers you want to keep an eye on. These are the high value symbols. The wild and scatters are represented by a neon pink 'Wild' icon (strangely enough), and a pink and green triangle. What really sets this slot apart is how the SuperStaxx bonus feature is activated. There's no particular symbol that activates the SuperStaxx mode, which could be confusing initially. Luckily, once you understand how things work, you'll have no problem aiming for the possible 400x win. Every time you spin, a random symbol is chosen as a part of a SuperStaxx set. If you can match these up across adjacent reels, then the big payout is yours. What's more, this feature is also active if you get any free spins. There’s one important difference in the free spin mode though: Only the high value symbols and the wild can stack. The standard low value letters won't work. 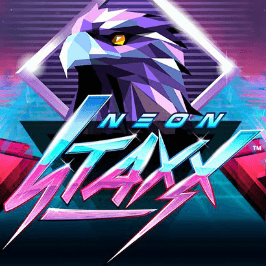 Overall, if you're looking for a fun, fast-paced, and slightly different online slot (or you're a massive fan of spandex), then the Neon Staxx slot is a solid choice. 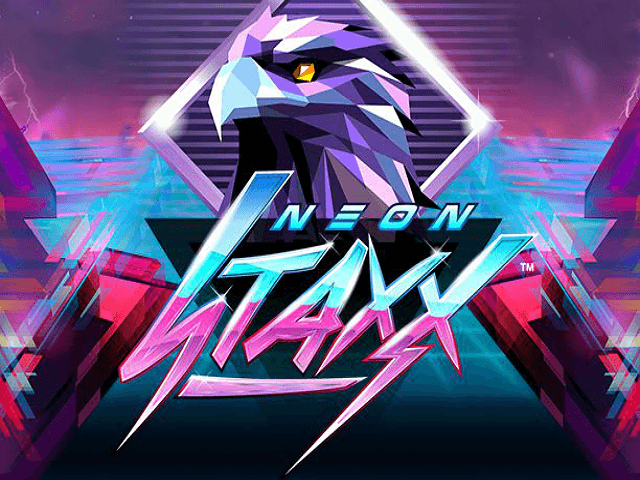 Share this Neon Staxx Review today! If you like Neon Staxx, you'll love these slot titles too!